Four-line display, One- and two-variable statistics, MultiView™ display shows multiple calculations at the same time on screen, Select degrees/radians, floating/fix, number format modes, Choose from three solvers: numeric equation, polynomial and system of linear equations, Display a defined function in a tabular form, Determine the numeric derivative and integral for real functions, Perform vectors and matrices using a vector and matrix entry window. 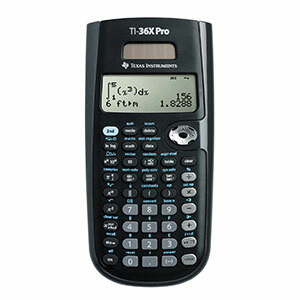 Exam acceptance The TI-36X Pro scientific calculator is approved for use on SAT*, ACT*, and AP* exams. 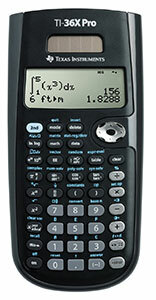 Ideal for: Algebra 1 and 2, Geometry, Trigonometry, Statistics, Calculus, Biology, Chemistry, Physics, Computer Science, College Math, College Science, College Engineering.